Money is made in commercial real estate by having the vision to create value where none before existing. Since prices are not transparent like stocks quoted at the bottom of your big screen TV, the person who accurately determines value is the one who comes out ahead. Smart commercial real estate investors use a tool called the Cap Rate, and this article shares the basics and how you can use it to your advantage. Whether you are investing in stocks or bonds or real estate or certificates of deposit, you do so to realize a greater value in the future. All of these investments have a value determined by two inputs: cash flow and appreciation. With stocks, you might get a dividend and hopefully capital gain, and with CD’s you get income and no gain, just your principal back, and with bonds you get interest, or cash flow, and principal back at maturity and maybe a gain or loss if the value of the bond trades higher or lower before maturity, but with commercial real estate, you also get rental income and maybe appreciation when you sell. The smart way to value all of these investments is to calculate the present value of the cash flows. That is, what you would pay today for the future income generated by the investment. If you expect to receive $100 one year from now, how much would you pay for that investment today? First, you have to know your opportunity cost, or how much interest you would earn on your next best opportunity. Let’s say you could earn 3% in a CD for one year, then comparing that to an alternative investment for one year that would pay $100, you would divide the $100 by one plus the interest rate (1 +3%), or 1.03, which is the same as $100/1.03 which equals $97.087. Therefore, you would pay $97.087 today for $100 in one year. To value commercial real estate, you use the same principal. You start with the calculation of the Net Operating Income, which is Gross Income less Operating Expenses, including vacancy and credit losses. You can get worksheets at the Louisiana chapter of CCIM. 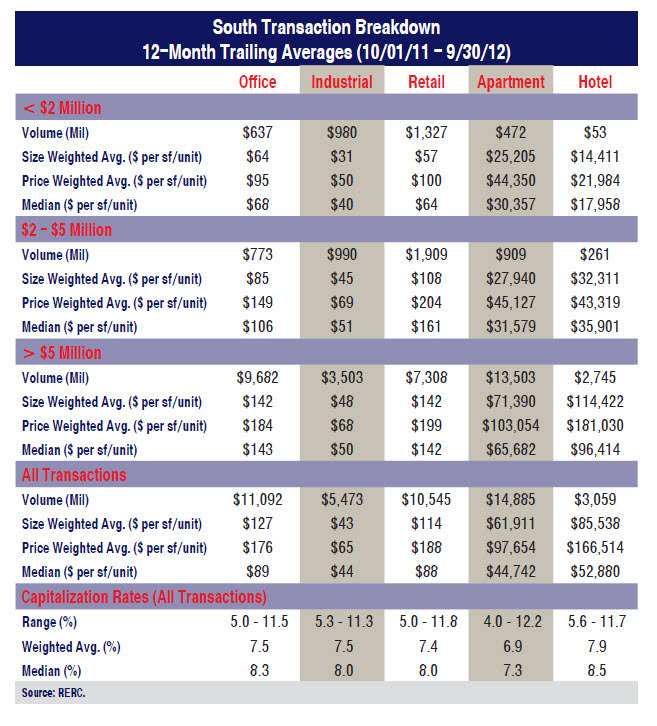 The volume of sales in millions of commercial real estate, according to value of the property. The size weighted average per square foot. The price weighted average per square foot. The median price per square foot. The range of Cap Rates and also the median, which reduces bias of extreme highs and lows that distort a mean calculation. The table shows that in the South, for apartment property, the Cap Rate range is 4 to 12.2 and the median is 7.3. The way you use this is the following: divide your Net Operating Income by the Cap Rate, and the result is the value. Lets say you have an apartment that produces $1,250,000 in Net Operating Income, and you then divide that by the table’s median Cap Rate of 7.3 ($1,200,000/7.3%=$17,123,287). Therefore, you would pay $17,123,287 for the property. This assumes no increase in value due to appreciation, but you use the same strategy to calculate an additional appreciation (as an investor though, you don’t pay other people for appreciation for which you create). You can read about a practical example of this Cap Rate in our April 2013 article on the Baywood Apartment sale on the west bank where the property sold for $18,000,000, which is a 6.944 Cap Rate. A small change in Cap Rate makes a big difference in value, so this tool is important in valuing New Orleans commercial real estate.